If there’s one thing you can’t deny about Siena College students, it’s that they’re all about helping others. 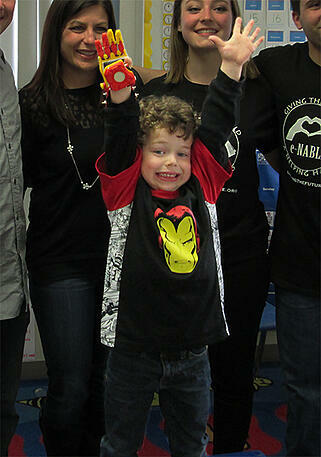 And on Tuesday, one such project led to a five-year-old boy in Ohio feeling like a superhero. Iron Man to be exact, per his request! Here’s the background: Jack Carder, 5, was born with a right hand that didn’t fully form. Through Enabling the Future, a global network of volunteers who use 3D printing to create prosthetic hands for people in need, Jack’s mom was introduced to Siena College. One of our graduating physics students, Joey Fairley, had recently launched a local chapter of the organization—and when the request to help Jack came through, Joey and 12 other students got right to work. Tuesday, the Siena team flew to Columbus to personally give Jack their first hand creation: a red and yellow, four-fingered hand that will give Jack greater function. Iron Man-themed, the hand features glow in the dark accents and an inscription that reads “Iron Man Jack.” And if that wasn’t cool enough, Jack used his new hand on Tuesday night to throw the first pitch at the Columbus Clippers baseball game—the Triple-A affiliate of his favorite team, the Cleveland Indians. Now that’s epic. Check out the ABC News video below and the media coverage on News 10, News Channel 13, Good Morning America, CBS Sports, Complex and the Times Union. And if biomedical engineering, physics or general miracle making is something that interests you, let us know. Congrats to the team—and to Jack!